If Niccolò Paganini has lead us to assimilate the capriccio as a free form, devoid of academic constraints, he has also added to it, in the collective sub-conscious, the image of fearsome virtuosity, technical prowess and almost surreal abilities pushing the instrument to previously unknown limits. His instrumental genius has almost made us forget that the capriccio existed before him, and that it could express enthusiasm, sudden changes of humour, resolutions or feelings. Thus came the idea of the Capriccio Quartet: bring together on the same recording composers of different centuries and cultures, from the origin of the string quartet (Haydn’s 6 Quartets from his Opus 20 are the first he named “Quartets” and no longer “Divertimenti”) up to the present day, with the recorded premiere of a work by Robert Fokkens. Certain composers on this recording are famous, others less so, but it is this anthology which has permitted us to express a wide array of moods and feelings as rich and varied as possible. Its intention is not to sum up all the existing capriccios but to create a voyage through a land of magical creations. The works on this album refer to different expressions of the term capriccio: a reference to the virtuoso genre employed by Paganini, the title of one of the movements of Haydn’s quartet, embracing the single movement form of the works by Weinberg and Fokkens, and reflecting the subject of the libretto of one of Strauss’s operas. In the rigorous framework of the string quartet, the capriccio offers freedom to each individual player. The Quartet Op. 20 No.2 immediately claims the freedom acquired by the cello which opens the work. In a sonata form setting, the first movement develops rapidly towards confusing harmonic paths. The minor key unison opening of the second movement instantly gives the dark character that often qualifies the Opus 20, and causes the listener to be lead for a few minutes to a loss of any tonal, rhythmic or melodic reference. The listener witnesses the rapid alternation of opposing effects, the first violin being able to indulge in “capriccio”before singing a beautiful accompanied melody. A relative lull is offered to the listener in the third movement while the composer sets himself the challenge, in the finale, of a four-voice fugue. The rigorous constraint of this contrapuntal form is emphasized by the nuance ‘sotto voce’(in a low voice), until the final break that allows the externalization of the quartettists. 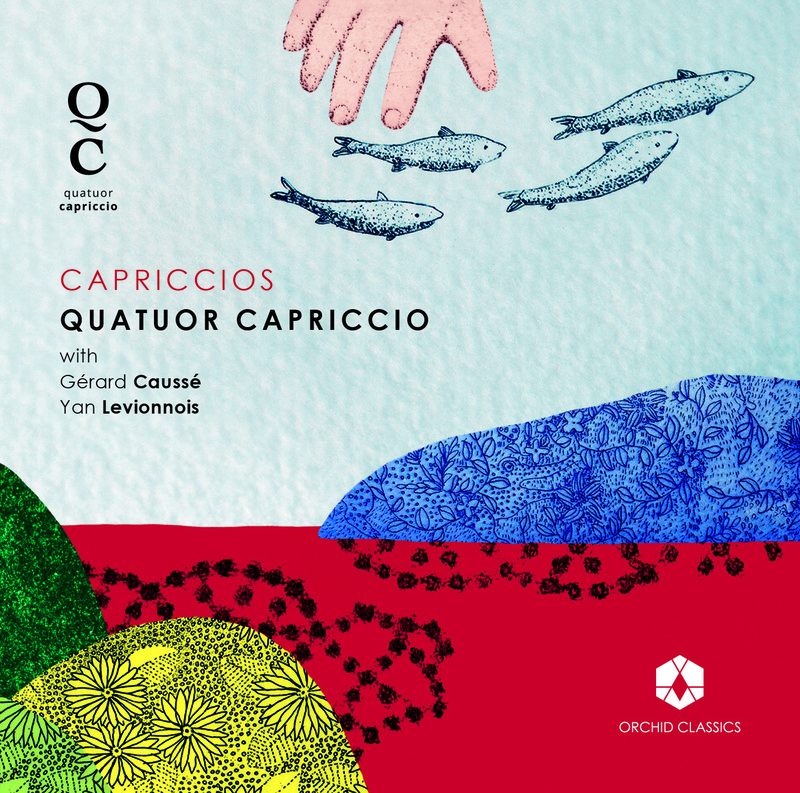 “In 2017 Quatuor Capriccio approached me through our mutual friend, violinist Nicolas Dautricourt, to commission a capriccio for their annual “Festival Capriccio en Maine”. They also mentioned in passing that one strand of the festival programme explored the form of theme and variations. Willingly accepting the opportunity to work with such an excellent ensemble, I set about exploring the notion of ‘capriccio’, and quickly discovered a little gem of information: although disputed, one theory about the origins of the word relates to an Italian Renaissance hairstyle – ‘capo riccio’ or ‘head hedgehog’. Whether this rather vivid image is historically accurate or not, the usage of the word in Italian developed to mean whimsy, fantasy and mercurial light-heartedness. From there, developed the use of it as a title for a range of musical works which relate to these ideas in some way – although even here, the usage is in itself rather capriciously varied. Paganini and Ysaÿe, two emblematic names of the virtuoso violin’s history, are here assembled into a work of different links: a theme composed by the Italian violinist, put into variations by Eugène Ysaÿe, a Belgian violinist, and arranged by Ysayë’s grandson. Of the 15 variations for violin and piano, only 13 are selected for the quartet. The virtuosity of the violin, the key instrument of the score, quickly spreads to the other instruments who in turn venture into technically brilliant features. But the capriccio of the work also comes from some adventurous research of harmonies, rhythms and modes of play. Weinberg’s personal and musical life can be summed up as a “search for freedom” (In Search of Freedom, Fanning, 2010). Born in Warsaw, he lost his family under the German occupation and moved to Belorussia in 1939 and then Tashkent (Uzbekistan) in 1941 before finally settling in Moscow in 1943. Capriccio Op.11 was composed in Tashkent. The form offered the young composer in exile the opportunity to explore a feeling of freedom. The melodic material, accompanied by a charming waltz, is riddled with lines at mocking intervals, the harmony gradually darkens, while the rhythmic sensation loses its stability by the incursion of irregular metrics. Mendelssohn’s Quartet Op.81, is the posthumous assemblage of four pieces for string quartet composed respectively in 1827 (Fugue), 1843 (Capriccio) and 1847 (Andante and Scherzo). Faced with this composite object that goes through 20 years of creative life, the listener is reassured by the imperatives of the theme and variations and the fugue form also present in the second part of the Capriccio. He savours the natural beauty of the melodic lines, enjoys the elf-like sparkle of the Scherzo and is delighted by fiery playing in the Presto variation or the Allegro fugato, assai vivace. All the resources of the quartet are exploited thanks to a non-hierarchical treatment of the instruments. In the Capriccio, after a beautiful melody, accompanied Andante con moto, the first violin lets loose to a cadential sequence of improvised pace before starting the fugue. Is this what gives the piece its title of ‘Caprice’? In the harsh setting of opera, Strauss gives himself the freedom of an opening entrusted to six instruments only, a piece of chamber music as such, over which slip the first words of the booklet: “– First the words … then the music!– First the music … then the words! “. A “conversation in music” is the subtitle of the opera and is the way that Goethe and Stendhal qualified the genre of the string quartet a century before. Strauss navigates between genres but also between styles: contrapuntal rigour, elegance and sobriety, softly-ornamented lines for the extreme parts, fiery style and recitativo for the central part. Composed in 1941, the opening sextet was written before the creation of the opera in 1942. The instrumental page had already lived, out of the context for which it was intended, and this tradition has persisted to the present day. Thus, this sextet fits smoothly into a recording devoted to the genre of the quartet. 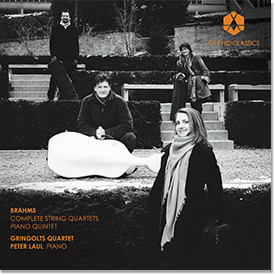 Founded in 2012, the Capriccio Quartet won First Prize at the international competition in Illzach the following year and were also laureates at the prestigious Bordeaux international quartet competition. In 2015 the Capriccio Quartet founded the festival ‘Capriccio en Maine’ where they aim to develop bridges between many art forms by mixing them around a common theme and thus share their artistic enthusiasm with a broad audience. Gérard Caussé has been exploring for many years, as a soloist, chamber musician, conductor and pedagogue, the multiple facets of the viola. He recently developed a passion, with Laurent Terzieff, for the dialogue between poetry and music which has led to a recording of Bach’s cello suites, transcribed for viola, interlaced with poems by Rilke. As a soloist he has collaborated with the greatest conductors, and championed contemporary music as principal viola of the Ensemble Intercontemporain since its foundation by Pierre Boulez. He is a chamber musician sought by regular partners such as Gidon Kremer, Mischa Maisky, Michel Portal, Renaud Capuçon, Frank Braley and Nicholas Angelich. He has taught at the Escuela Reina Sofia in Madrid, at the Conservatoire Supérieur in Paris and as a conductor, has been musical director of the Toulouse Chamber Orchestra and the Camerata of the Caja Duero foundation in Salamanca. Not only his audacious choices, his virtuosity, his notable tone, but also his determination to constantly enrich the viola repertoire, commissioning works by Philippe Hersant, Michael Levinas, Pascal Dusapin, Hugues Dufour, Betsy Jolas, Wolfgang Rihm and Gérard Pesson, have established him as an indisputable figure of the viola commended by his peers, audience and critics. Eric Tanguy and Krystof Maratka. He plays a cello made for him by Patrick Robin in 2005.